In the last couple of years Cadillac V-Club member Beverly has shown a level of ambition that only a select few have been able to compete with. In 2018 she won the Cadillac V-Racing Invitational Shootout "Top Gun" championship at Texas Motorplex and in 2019 Beverly was runner-up in the Pro-modified Unlimited Class. Last week at the annual TX2K event in Houston, Beverly portrayed this dominating trait yet again, and this time added a purple twist to her 2014 CTS-V, also known as SHEGONE. 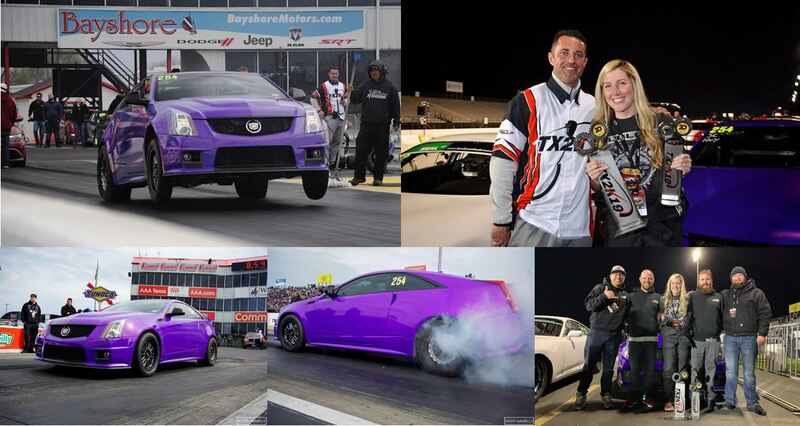 Beverly's CTS-V Coupe was built and tuned by Matt Owens of Dedicated Motorsports in Weatherford, Texas. The V-Coupe has a Kong Performance ported blower and air intake, ported heads, cam, aftermarket exhaust system, 1700 Injector Dynamics fuel injectors, upper and lower pulley, ice tank to cool the blower air charge, LSR block, Driveshaft Shop axles, and driveshaft. The car weighs in at 4230-pounds with the factory seats removed with a race seat replacing the heavy drivers unit. In the Street Car class she took out a 800 hp 2012 Corvette in the final eliminations with a .388 reaction time at the tree and a 9.369 ET. She also completed a new personal best ET of 9.29 during the weekend. Being a female in a predominantly male environment shows that this lady is confident, and a true force to be reckoned with. We look forward to seeing more of Beverly and her stunning purple V2 throughout our future events of 2019 with the Cadillac V-Club. Beverly took home two trophies from TX2K19 as she was also runner-up in the Heavyweight class by taking on an Charger Hellcat driven by Zdung Ho. The crowd was pulling hard for the Caddy, but it was not meant to be. Ho’s Hellcat got away first and just kept on pulling, taking the win with a 9.21 to Feaster’s 9.38. Congratulations Beverly, well deserved, and a true example of what Cadillac is known for….being the standard of the world and demonstrating V-Performance dominance. 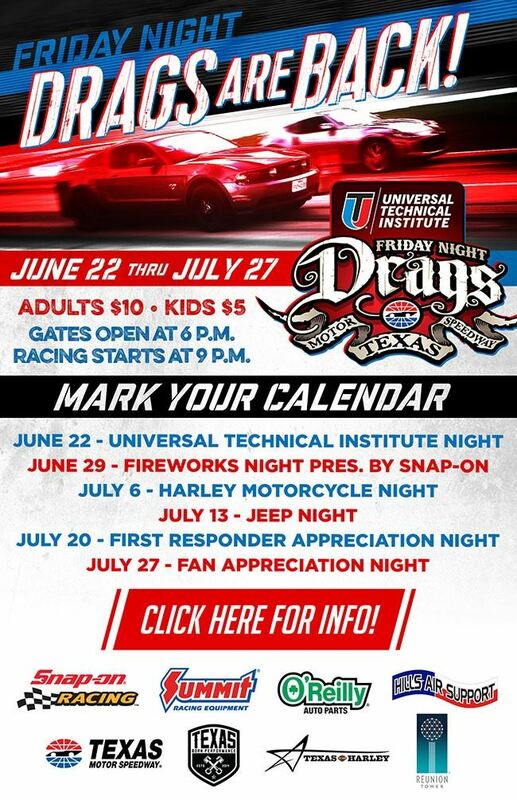 Texas Motor Speedway Friday Night Drags Are Back! The Inaugural Cadillac V-Racing Shootout is now history with 48 V-owners competing in 4 different drag racing classes. The weather was mostly sunny with the temperature in the mid 60's and the staff at Texas Motorplex delivered as promised by prep'ing the track for excellent traction after a solid week of rain. Congratulations to Beverly Feaster of Austin, Texas whose 9.68 E/T in her Dedicated Motorsports built CTS-V Coupe was the fastest overall for the event. In the CTS-V Modified Class finals she ran a 9.768 and matched up against Antwaine Hobbs of Round Rock, Texas who ran a 9.765 E/T but "red lighted". Beverly claimed the CTS-V Modified Top Gun Award and $500 cash. In the ATS-V Modified Class, Kenneth Raby's 11.28 E/T was the fastest of the day and Kenneth matched up against Thomas Shelton of Houston in the finals. Kenneth claimed the ATS-V Modified Top Gun Award and $500 cash. In the CTS-V Stock class, the Top Gun Award went to Mark Gray with a 12.06 E/T who edged out Chad Doerr's 11.96 E/T. In the ATS-V Stock class Top Gun Award went to Jim Cappiello with a 12.00 E/T who edged out Lynn Hayes 12.31 E/T. Both Mark Gray and Jim Cappiello received a 1 year extension of their V-Club membership as their prize valued at $150 each. Only 12 drivers opt'd in for the Unlimited Roll Race Class where the drivers were paired by a blind draw until the finals. Once again, Beverly Feaster's CTS-V came out on top driven by Matt Owen who defeated James Corona of San Antonio in the finals. Chase Blackson finished 3rd in his Frankenstein Engineering built CTS-V Coupe. Located in Trumball, Texas about 20 minutes south of Dallas in Trumbull Texas right off I-45. 1/8th mile track. Scheduled to open in Fall of 2017 or Spring of 2018 at the latest.